Smoothes skin without leaving a sticky after effect. Apply to hands, feet, elbows or any areas of the body that need extra moisture. Absorbs instantly with no oily residue, or the greasy feeling of many lotions. One of our customers actually told us about this product, wondering why we didn't have what she says is the best hand treatment available. Considering our rave reviews for all other things HABA, we ordered up some samples to test. We are impressed! This silky smooth, thick, white cream goes into the skin completely, and hands feel like they're being watered from below the surface. It is indeed a treatment, reviving chapped and dry skin. nothing that can harm it. 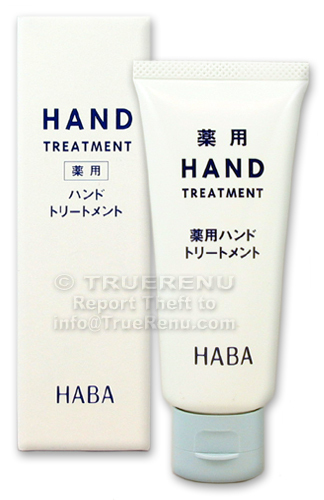 Use HABA Hand Treatment every time you wash your hands to keep them soft and protected all year round. Massage some into rough or flaky patches all over your body, especially elbows and feet. No perfumes or artificial fragrances make it ideal for men and women. Apply to hands, feet, elbows or any areas of the body that need extra moisture. Smoothes skin without leaving a sticky after effect. Ingredients: Stearyl Glycyrrhetinate, Squalane, Tocopherol, Retinyl Palmitate, Corn (Zea Mays) Oil, Hydrogenated Lecithin, Hinokitiol. Product Size: Net Weight: 70g (about 2.4US oz.) in a flip cap tube. If you are new to Komenuka Bijin and want proof of its power, try the Moisture Cream. It tightens, softens and smoothes instantly. Absorbs completely, no oily residue - perfect for summer or after workouts! Non-comedogenic.